Congratulations John Lowther and Paul Switzer! The event is a classic chase race from the KYC clubhouse (start times ranging from 11:00 - 11:45 am) to our Wolfe Island property at Jemmett's Landing, with the victor receiving the Partridge Bowl and its contents (i.e. lots of good gin), followed by a chicken and rib ($25) and assorted festivities. Please email manager@kingstonyachtclub.com with your reservations. The Orange Peel will be making the trip on Saturday and can take several members there (departing the club gas dock shortly after 11:30 am) and back (departing Jemmett's Landing early evening and arriving back at the club an hour later). For race details please refer to the "Sailors Handbook". Please sign up with Greg so we can plan food accordingly. As we are nearing the end of July, the Junior Sailors are very busy! Coming up next week we are excited for Cedar Island Day on Tuesday, our Youth Regatta on Thursday, Casino Night Thursday evening, and Junior Awards on Friday! There are still some spaces available for sailors in August but they are disappearing quickly! Casino Night is in less than a week and the instructor staff has been working hard to make it another fun filled night! 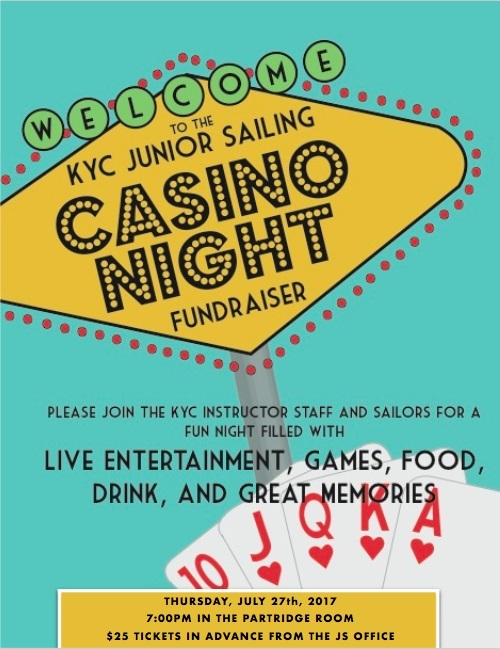 Invite your family, friends, and fellow sailors down on Thursday, July 27, 2017 at 7:00pm to support the Junior Sailing program and enjoy games of Black Jack, Roulette, and Texas Hold'Em. Tickets are available now in the Junior Sailing office or at the door for $25 each. We are still welcoming any donations for our raffle prizes, so if members have anything to donate please contact juniorsailing@kingstonyachtclub.com, it is greatly appreciated! Hope to see you there! KYC Sharkies are currently competing in the Shark Worlds in Toronto. Current placings (in the fleet of 47 boats), after 7 races are: 5th JLS (Peter Van Rossem), 6th Shadfly (Steve Raddon), 19th Cariad (Melodie Gummer), 33rd Inevitable (Robin Wyunne-Edmards). Go team KYC! KYC boats were away racing in EYC 2017 at Oswego Yacht Club last week. Force 10 (Bob Crowson) finished 9th and Seattle Slewp (Peter Kraszewski) 15th in a fleet of 19 boats, Unfortunately, Teyma (Robert Weguelin) was forced to leave the USA shortly after arriving by overzealous (but misguided) Border Patrol. Upcoming regattas being hosted by KYC include Shark Canadians in Aug 12-13 and Albacore North Americans Aug 25-27. If you would like to help out, either on shore or on the water, for either of these regattas please contact robert.weguelin@kingstonyachtclub.com. Due to high water this year the model boat fleet has been grounded, however they have not been idle. 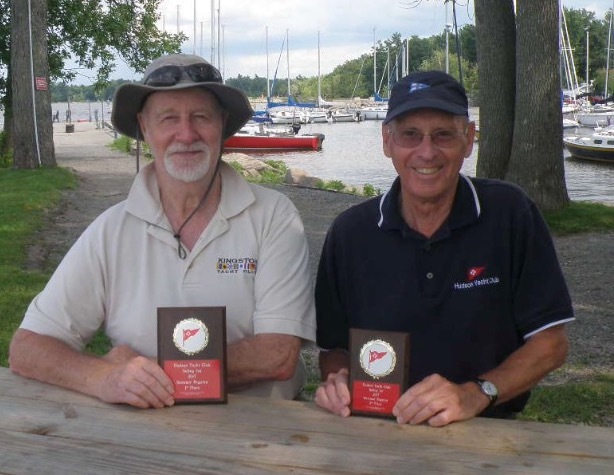 Paul Switzer went to Toronto in the Spring and won the Soling Canadian Championship for the third year in a row. Congratulations Paul. This past weekend the Solings raced in the Hudson Summer Regatta and John Lowther came away with a victory. Congratulations John. It doesn't seem to matter the size of the boat but KYC sailors appear to excel where ever they sail. In June, the club was awarded the Canadian Society of Club Managers Small Club of the Year Award (for clubs with total revenues under $2 million). Kingston Yacht Club general manager Greg McNab was honoured to win the award, presented to affiliated clubs that showed significant innovation, leadership and social responsibility. 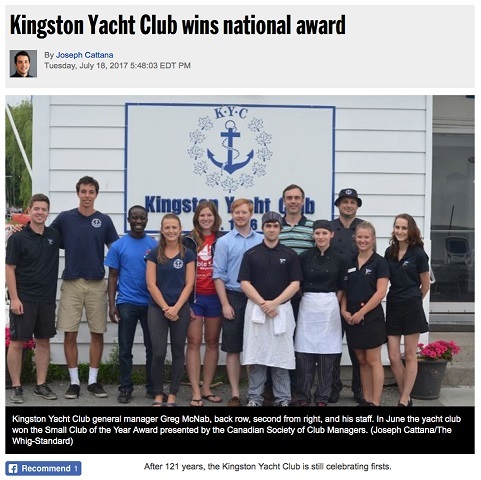 “I have been at the club for three years and since Day 1 it was a part of my ambition to get Kingston Yacht Club as a winner for club-of-the-year award,” McNab said. After submitting its nomination, McNab said he believed the club had a strong year in terms of community involvement, environmental stewardship, hosting exceptional events and their leadership development. 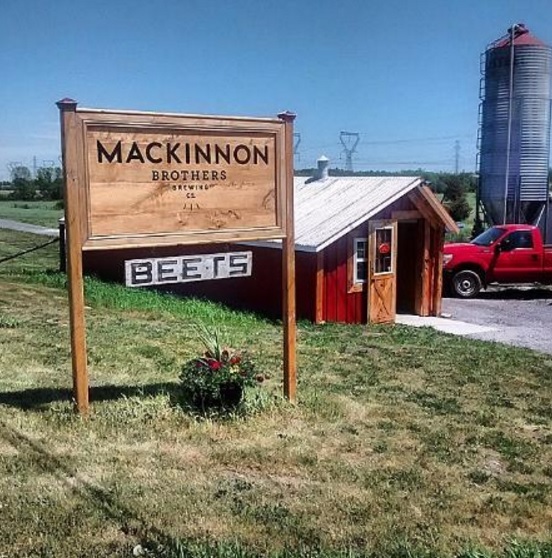 “We have some exceptional athletes here at the club, our food and beverage is fantastic, and I just kind of wanted to let the world know, and Kingston know especially, about how good we are down here,” McNab said. Over the past year, the Kingston Yacht Club has attempted to build a positive atmosphere down at the water for everyone. The club hosts picnics throughout the year and yoga every Wednesday night, and McNab is hoping to change people’s idea of the waterfront. “Many people think of private clubs as something that is not attainable, and people also think that just because it’s a yacht club, you have to have a boat to be a member down here, and that’s not the case whatsoever,” he said. In terms of hosting events, Kingston has developed to become a hotbed for competitions. From July 7-9, it hosted the Viper 640 Canadian Championship, and the 49er and 49erfx Junior World Championships from June 28 to July 2. McNab also stressed the club’s partnership with CORK Kingston. At CORK’s 49er and 49er FX North American Championships in June, Olympic hopefuls Mariah Millen and Ali ten Hove from the Kingston Yacht Club came second in the women’s 49er FX fleet. One area many wouldn’t associate with a yacht club is food and beverage sales. With revenue doubling over the past two years, McNab said the club has turned that area around. By winning Club of the Year, McNab said he is looking for potential membership growth. While other marinas are seeing a decline in size, the Kingston Yacht Club has built 11 new docks and is upgrading 13 more. As a result, McNab believes it has great potential to add more people and boats. With a strong junior sailing program that runs throughout July and August, McNab said the club wants to educate and promote the benefits sailing can offer Kingston’s residents.